Been diving in Hol Chan? Please Vote! San Pedro has a dive site called Hol Chan just 10 mins out by small boat. We almost decided against going there on our trip, BUT I am very glad we didn’t. During the whole Belize trip, I was looking forward to trying to photograph eagle rays and this was definitely the place for it. 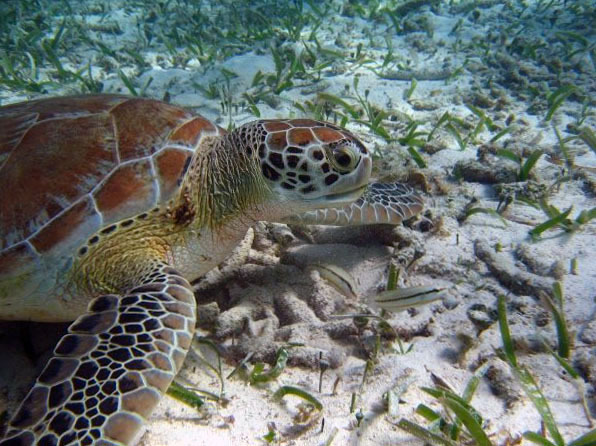 The dive is very shallow, 8m at the most, and has a sandy seagrass bottom. Lazy green turtles were busy feeding not seeming to care that we were 3 divers watching them intently. 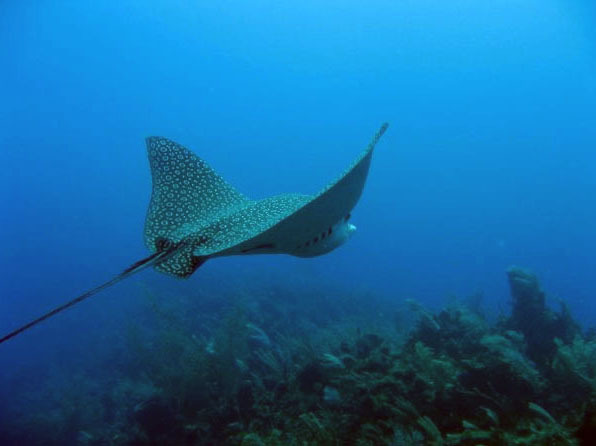 Then in the clear blue water, I spotted the eagle ray making its way towards us. It seemed to pose happily for the camera making circles around us with slow graceful movements. I was delighted with this encounter and would have ended the dive with a big grin, but the show was not over yet. Another 2 eagle rays appeared in the background and joined the circling. Map of Belize, Hol Chan dive site.